Why Entrepreneurship? What are all the benefits of Entrepreneurship? Here is the definition from Wiki.. Entrepreneurship is the process of starting a business, typically a startup company offering an innovative product, process or service. The entrepreneur perceives an opportunity and often exhibits biases in taking the decision to exploit the opportunity. On my mark.. Entrepreneurship is a process of building an effective product/service with a team by transferring the vision to the team members from an Idea turning it into a profitable venture. Getting into Business simply because you want to make money (profit) is far too much a price to pay as an Entrepreneur. I mean isn’t that what employees do; working nine-to-five in order to make ends meet? 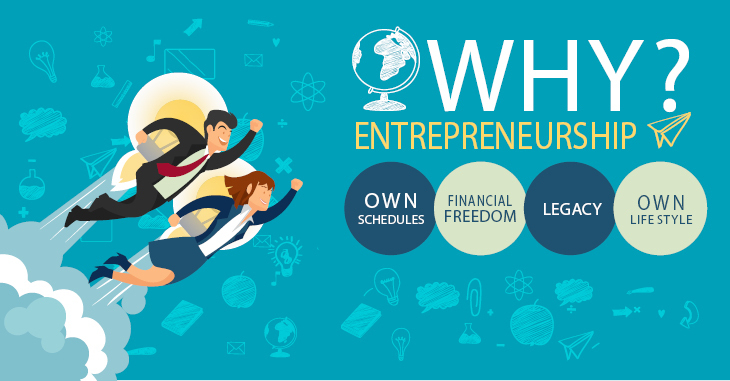 Why in the world would you choose to become an entrepreneur (be your own BOSS??) just because you want to make a living when there is already a far more easy alternative for that –employment. If you are so much in need of money in order to make a living (survive), better go back to a 9hrs job and stop posing as an Entrepreneur. Survival (making a living) is not the goal of entrepreneurship but rather significance (making a difference). Entrepreneurship is not the ideal choice for those who are feared of Facing failures & who always listens to the Naysayers and not trust themselves. Entrepreneurship is for those who really believe in themselves & who is ready to design their own rules and builds a team who fits into that. Entrepreneurship is about using your life to do what you really love and truly care about –Passion. A true entrepreneur at their very core is a betrayer; someone who is bent on creating change even though it means going against the norm. Does this sound like you? “NO PAIN NO GAIN” Not Everyone can easily achieve the benefits without facing the troubles. Benefits are just the final step of the problem. It’s Up-to you minimizing the steps in solving the problem (like how in Algebra). For the most part, as an entrepreneur you have greater command of your schedule. However, you will likely have many more demands on it as well. “Contrary to popular belief, you don’t come into the world with nothing but your naked self. You’re actually already in possession of one of your most important gifts: time.” What will you do with yours? 3. Bringing Ideas to life. Entrepreneurs bring ideas to life. “If you know that you will not find peace in your life until your vision becomes a reality, you are willing to invest valuable resources, and acquire new knowledge” it could be time to start your own business. What will be your life’s legacy? According to SUCCESS magazine your legacy is, “something you create during your life solely to benefit future generations…” Here it not only means money for the future, But also the opportunities which we left for the future by creating new Business. 5. Impact the lives of many. Yes it is not only for you, But also for the Benefit of many people who is seeking for the survival with plenty of Talents & potential. We actually lead & guide a community for their Financial Benefits. 6. Business as an investment. 7. Design your own Lifestyle. Are you a morning person/ Night Owl? Do you prefer to work from remote locations around the world? Do you like to take trips often? One of the perks of entrepreneurship is the creative ability to design the lifestyle that best suits your desires. Whatever it is Decision is yours. Plan & Execute for you & you only.